Jhaurmael was always a poor elf by elf standards. His father was a wizard of minor repute on Evermeet, and his mother was a dreamy-eyed seer. Conceived in a fae tryst, his mother drifted away soon after his birth, leaving him to be raised by his father. A better wizard than a parent, Jhaurmael's father raised him to study magic. The child seemed to have great aptitude and mastered cantrips with surprising ease. But as he studied complex, systematic magic, Jhaurmael's sorcerous nature betrayed him. Some spells and concepts he grasped instantly. Others, he never could, or had no interest in. He was a failure as a wizard. At the time, the area was still firmly under elven control. Though Jhaurmael was far from home, the elves of Moonwood took him in with no questions. He was still an oddball with his spontaneous use of magic, but the elves of Moonwood were more willing to accept anomalies, and they had no expectation of how Jhaurmael "should" practice magic. They just took him in as he was. This acceptance had a profound affect on the young elf after decades of disapproval and shame. He passed that level of acceptance on to everyone else in his life, and he never judged another creature by appearance or expectation. This philosophy has caused him to be something of a drifter since the sorcerer rarely allows people to get too close lest expectations crop up in a relationship. But despite (or because of) this emotional distance, he remains amazingly easy to get along with. Jhaurmael lived calmly in Moonwood for many years until he saw the thing that would change his life: a portal. Like a dwarf to rock, Jhaurmael took to portals. He understood their theory and construction immediately. He knew how they worked and how to make them better. The very thought gripped him, and he immediately became a student again. Working with his natural inclinations instead of despite them this time, Jhaurmael embarked on a lifelong fascination with portals. Studying portals practically requires one to traipse into dangerous locales, so Jhaurmael began a lifetime of wandering into and out of any place a portal could take him. As he grew in magic and power, he apprenticed himself to anyone who knew enough to build a portal. Often as much master as apprentice, Jhaurmael filled books with notations and sketches for portal construction and improvement. By the time he was powerful enough to build his own portals, he had a reputation among professional portal builders for unconventional design and exacting craftsmanship. Jhaurmael quickly grew rich and famous off of portal building, but he bored with making escape hatches for nobles. Eventually, he stopped taking commissions unless the construction or environment of the portal challenged his creativity or expertise. He didn't care who his clients were; their loyalties, politics, and morality meant nothing to him. He professes a passing reverence for Shaundakul and vague aspects of the elven pantheon, but he holds no strong religious ties. His religion, such as it is, is the challenge of portals. He would go nearly anywhere and face improbable odds to further his craft. As a professional, Jhaurmael began calling himself "portal-master" with no trace of irony. It's a simple fact (in his mind) that he knows as much about portals as any mortal, and he has spent his entire adult life studying them. The title sounds so pompous that few other people use it besides Jhaurmael. But he feels it is fitting and continues to refer to himself by the title when he feels it appropriate. Jhaurmael has an innate understanding of teleportation magic, which he loosely defines as "ignoring distance." Like all sorcerers, his grasp of magic is intuitive, not logical. Unlike most sorcerers, however, Jhaurmael believes that he has drawn a theory of magic out of his intuitive understanding, and he has been writing it down for the last 90 years in a treatise entitled "A Different Art: Formulae Encompassing a Heretofore Prelinguistic Expression of Magic." The few arcane magic users who have read the work-in-progress (and there are precious few indeed) find it nearly indecipherable and possibly a hoax. However, the red great wyrm Klauth is said to have remarked, "How inventive," after perusing a few pages. Jhaurmael still spends most of his time traveling, scouting new challenges, and experimenting with the seemingly endless chains of portals across Faerûn. He does have a home, though. Rather than a tower, Jhaurmael lives in a one-story manse that sprawls across vastly separate areas of the continent. To a master of teleportation, proximity is not an issue -- anywhere can be home. Thus, Jhaurmael's "home" exists in several different buildings in different parts of Faerûn. He has portals built into doorways so that stepping from room to room can move him from nation to nation. However, the largest building and the place where his presence is best known is in the Silver Marches. Deep down, the sorcerer still feels most at home in the Moonwood, which is the place where he was first accepted after so many years under the scorn of Evermeet's wizards. 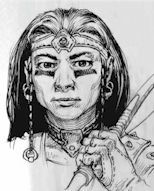 Jhaurmael Riversedge: Male moon elf Sor20; CR 20; Medium-size humanoid; HD 20d4+20; hp 74; Init +4; Spd 60 ft.; AC 25, touch 18, flat-footed 21; Atk +13/ +8 melee (1d8+3/19-20, +3 disappearance longsword); SQ elf traits; AL N; SV Fort +8, Ref +10, Will +13; Str 10, Dex 19, Con 12, Int 17, Wis 10, Cha 29. Skills and Feats: Concentration +23, Jump +10, Knowledge (arcana) +18, Knowledge (architecture and engineering) +11, Knowledge (geography) +12, Listen +9, Search +5, Spellcraft +26, Spot +9; Alertness, Craft Wand, Craft Wondrous Item, Create Portal, Education, Magical Artisan (Create Portal), Strong Soul. Elf Traits: Jhaurmael is immune to magic sleep spells and effects. He has a +2 racial bonus on saves against enchantment spells or effects. Jhaurmael has low-light vision (can see twice as far as a human in low-light conditions) and is entitled to a Search check when within 5 feet of a secret or concealed door as though actively looking for it. He is proficient with the composite longbow, composite shortbow, longbow, longsword, and rapier. He also has a +2 racial bonus on Listen, Spot, and Search checks (already figured into the statistics given above). Sorcerer Spells Known (6/9/8/8/8/8/7/7/7/7; save DC = 19 + spell level): 0 -- arcane mark, dancing lights, detect magic, flare, mage hand, mending, open/close, prestidigitation, read magic; 1st -- detect secret doors, hold portal, magic missile, message, shield; 2nd -- arcane lock, knock, locate object, misdirection, whispering wind; 3rd -- analyze portal, blink, dispel magic, nondetection, tongues; 4th -- detect scrying, dimension door, dimensional anchor, scrying; 5th -- fabricate, passwall, sending, teleport; 6th -- gate seal, repulsion, true seeing; 7th -- greater scrying, teleport without error, vanish; 8th -- discern location, etherealness, screen; 9th -- gate, Mordenkainen's disjunction, teleportation circle. Possessions: boots of striding and springing, bracers of armor +7, cloak of Charisma +6, gloves of Dexterity +4, +3 longsword of disappearance, periapt of health, ring of protection +4, (wand of magic missile (9th-level caster, maximized). +3 Longsword of Disappearance: Jhaurmael's longsword is more for show than use. Still, it works remarkably well in a pinch. When the command word is spoken, the sword affects its wielder as improved invisibility. The sword has an additional misdirection effect operating on it, causing the invisibility to detect as transmutation magic. Anyone watching the wielder or analyzing the lingering magical aura with detect magic is usually led to believe that the wielder has teleported away rather than turned invisible, leaving the wielder free to strike unexpectedly. Caster Level: 9th; Prerequisites: Craft Magic Arms and Armor, improved invisibility, misdirection; Market Price: 70,315 gp; Cost to Create: 35,315 gp + 2,800 XP.